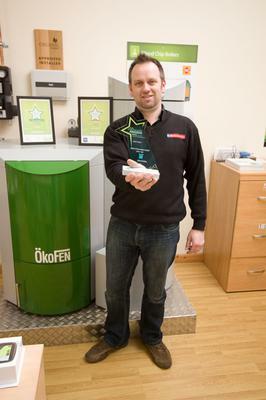 An Anglesey company, Menai Heating Ltd, has won the Boiler and Renewables Installer of the Year, Wales, at the Green Deal Awards held in Cardiff this week. "Recognition for my team’s dedication is fantastic. At Menai Heating we all take pride in our work and are dedicated to fitting the highest-quality renewable systems for our customers," said Lee Maher, Director, Menai Heating Ltd, Anglesey. The Regional Awards recognise the efforts of a "Green Deal" registered "Installer of Boilers and Renewables" to provide excellent customer service and demonstrate a high standard of quality. The 2015 Green Deal & ECO Awards, featuring RHI and Energy Efficiency, are now in their second year and celebrate those who have worked hard to make the Green Deal and ECO schemes a success. The judges looked at the company’s expertise and referred to customer endorsements to decide the winner. "We want to be a green business. It is very important to us and it saves us money in the long term. Our oil bill was astronomical. We worked with Menai Heating to design a system for the Inn to provide all the heating and hot water required for our busy business. We built a new laundry room to accommodate the renewable-fuel woodchip boiler from renewable experts, Menai Heating," says Karen Wright, owner at The Glan Yr Afon Inn, Holywell, Flintshire. Menai Heating is a family-owned business and has three full-time fitters and three support staff to provide expertise in renewable energy systems. It works with both domestic and commercial properties and has fitted renewable systems in large houses, nursing homes, B&Bs, hotels, an Eco Guest House, the Bala Well Being Centre and the Beacon Climbing Centre. It fits Biomass heating systems including wood pellet, wood chip and log regasification boilers, and in addition fits ground source heat pumps and a range of solar systems. "We design and fit quality renewable systems for our customers. I have been fitting heating systems for 20 years and renewable systems for 10 years. We only supply superior renewable systems that are especially fuel efficient and will last for 20 years," says Lee. Last year Menai Heating moved to a new showroom at Gaerwen Industrial Estate on Anglesey, with a working demonstration biomass boiler. "We offer a full range of renewable energy services and are expanding our business by adding an additional plumber, gas fitter and authorised Green Deal Assessor to our team this year. This award has come at a time when we are expanding and will continue to provide the highest levels of customer satisfaction," says Lee. For more local articles and stories, subscribe to our Anglesey Newsletter here. It's as easy as 1-2-3!